Beautiful Incentives: 12 Days of #Christmas #Giveaway! 12 Days of #Christmas #Giveaway! I am so excited to offer readers this awesome giveaway by fellow blogger and friend of How Was your Day? One Lucky winner will get 12 very unique and useful products. Enter the RC Below. Good Luck! We’re all familiar with the traditional 12 Days of Christmas, right? Where each day, someone gives you something. 5 Golden Rings, 8 Swans, blah blah blah. Well, here at , we have our own version! We’ve gathered up a list of 12 items that we think most people would love to have. $10 Chili’s Gift Certificate. Who doesn’t want to go out to dinner? Chili’s is somewhere you can take the whole family! Tibetan Bracelet – A gorgeous bracelet that’s a lovely weight. Definitely a statement piece. Chapstick – You’ll get three tubes of Chapstick – Classic Spearmint, Classic Cherry, and Classic Strawberry. 3 bottles of Smallish Polish – Smallish Polish is a great new indie brand of nail polish. You will get three bottles of your choice! Necklace – A necklace from the Charmed line at The Luncheonette. Eos Lip Balm – You will get two-pack of eos lip Balm. The flavors are strawberry and watermelon. Braided Bracelet Kit – This kit contains supplies to make 2 bracelets. $10 Starbucks Gift Card – Have a cuppa on me! 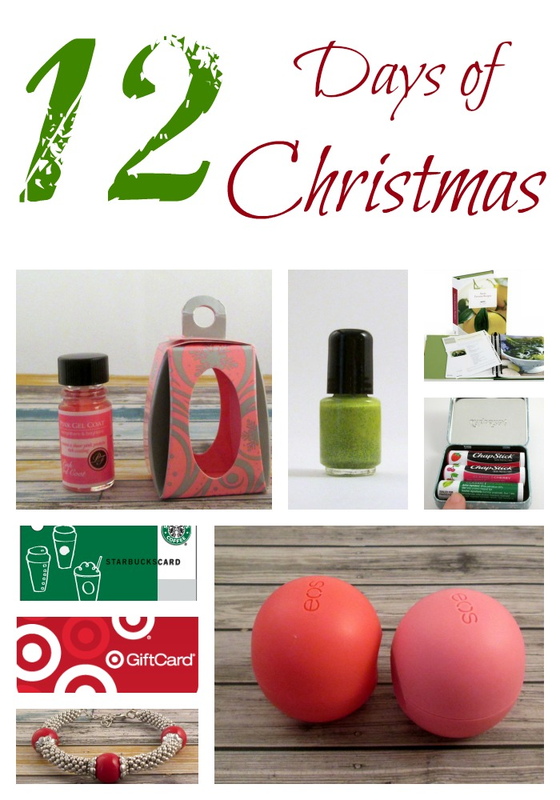 $10 Target Gift Card – Buy yourself a little something! Tastebook – Make your own custom cookbook! You’ll get a code that’s good for a custom 24 page cookbook. Pink Gel Coat Nail Strengthener & Brightener Mini – This strengthens and brightens your nails. It seriously works miracles! All these goodies will be loaded into a gorgeous clutch bag! All told, this prize pack is valued at over $150! Ready to enter? Do so in the Rafflecopter form below! Oh yeah, it's open Worldwide, too!! 'Cause that's how I roll! I am excited about the gift cards. I would like to share them with my friends. I am most excited about the Pink Gel Coat Nail Strengthener & Brightener Mini! I am most excited about the clutch bag and the eos lip balm. The nail polish from Smallish Polish ~ Thank you for the giveaway! I'm excited about about the Target GC.